My wife was recently on a grocery excursion when this particular bottle of root beer caught her eye, so she purchased aforementioned beverage and brought it home to me. 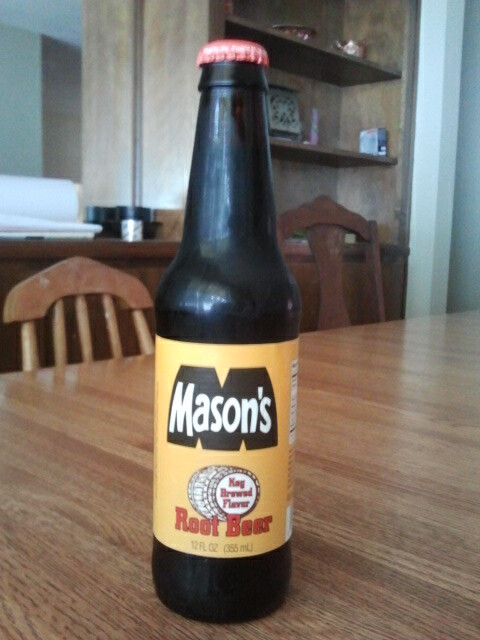 On the bottle, Mason's proclaims they have a "Keg Brewed Flavor"-which might be true. It is a good root beer, very root beer-esque, if you will, but it seems the keg it was brewed in was mostly already filled with Hires anyways, so they just put that in their own bottle and called it a day. I don't really think I need to say anything else. Ummm...it caught my wife's eye for some reason-yellow label and kegs maybe? I like the vintage look of the non-color Kegs and the basic brown/red on yellow. Tastes exactly like Hires. Fake sassafras, a little wintergreen and a smidge of vanilla for creaminess. There's nothing wrong with tasting like Hires, it's one of the best and oldest out there. Nearly every company has made a Hires clone, so it's not really a wonder I stumbled across yet another one. If you've never had Hires and aren't exactly sure what it tastes like, go to the store and buy a bottle of root beer extract-nearly every brand is just a Hires clone. Root beer barrels are also Hires-flavored, even the A&W brand. It'd rate higher if it were Hire's, but incidentally it's not. Thanks for the post. I really found it nice and informative.. Got a lot of idea in here ..